Canada is big. You just won’t believe how vastly, hugely, mind-boggling big it is. 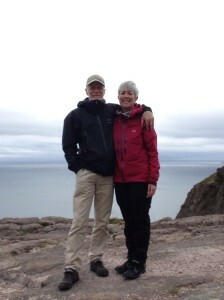 Had it not been for the lure of sleeping in our own beds and the excitement of seeing our grandchildren, we might have spent a few more days in St. John’s, if only because it is such a charming and delightful place. 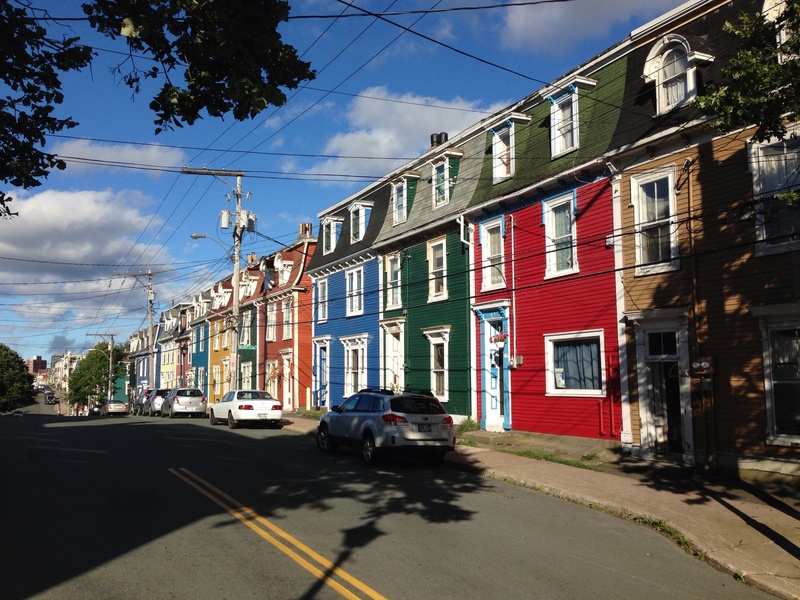 Perched on the rocks overlooking St. John’s harbour, the city appears to be a smaller version of a northern San Francisco, with its steep streets and brightly-painted wooden houses. 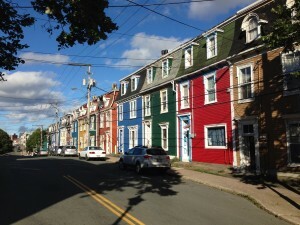 St. John’s has experienced a few great fires, the last being in 1892, which destroyed much of the city. As a result, the old city streets are lined with 3-story houses rebuilt in attractive Second Empire style. 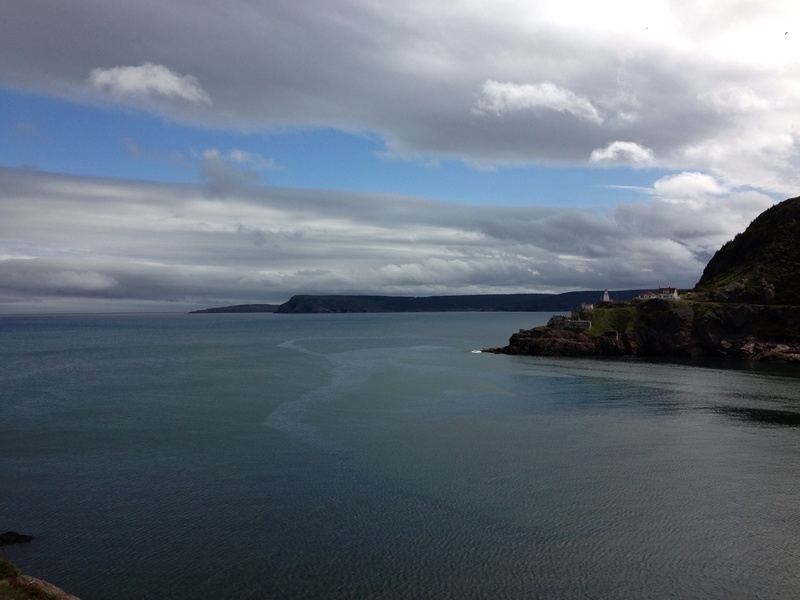 From our hotel room, we had a spectacular view of Signal Hill and the Harbour. With some relief and, yes, a tinge of sadness, we left our bikes at Canary Cycles to be boxed and shipped to us c/o West Point Cycles in Vancouver, courtesy of Purolator. There, we ran into fellow cyclists, Jesse and Jackie, a young couple we had met waiting for the ferry at North Sydney. Flying from Montreal, they had begun their cross-continent trip in San Diego, cycling up the west coast to Vancouver, along Vancouver Island, taking the ferry to Prince Rupert, and then making their way across the country to St. John’s. We exchanged stories later over drinks and dinner at the YellowBelly pub. We were also on the same walking tour of St. John’s the next day, led by a flamboyant Mr. Doyle, who took us through the backstreets of the city, past Garrison Church, Lieutenant Governer’s House and the disused Confederation Building, occasionally stopping to recite amusing excerpts of speeches or newspaper articles relating to Newfoundland’s colourful past. A walk up Signal Hill gave us wonderful views of the Atlantic Ocean as the ever changeable weather cleared to blue skies and sunshine. It was instructive to learn more about Marconi’s first transatlantic radio transmission, especially given that, at the time, no one knew why it worked. The Art Gallery housed in “The Room” was showing a 50-year retrospective of Mary Pratt’s work and we were also pleased to be able to see more paintings by Christopher Pratt and by their teacher, Alex Colville. Yesterday ended listening to a local band playing Irish, as well as more contemporary, music in O’Reilly’s Pub. We started our long flights home with a good view of the Avalon Peninsula and what appeared to be the TCH. Flying across the country, it was funny to think that we had really cycled the entire way! Maritia and Jade met us at the airport in Vancouver, with a big sign welcoming us back. It’s great to be home! In wrapping up this trip blog, we would like again to thank all of our family and friends for your support on the way; those who commented on the blog and added humour to our days, those friends who welcomed us with such wonderful hospitality, to Marius and Helen for wanting to join their uncle and aunt in this adventure and providing great company through Quebec, to Maritia who arranged for flowers, chocolates and a balloon to be delivered to our hotel room in St. John’s, and, finally, to our fellow cyclists whom we encountered on the road, for sharing your experiences, your friendship and love of cycling across this incredible land. – the spinoffs (no pun intended) of such an expedition are about more than the physical.